A Private Collector, acquired from the above circa 1940. A Lady of Title, by descent from the above; sold Sotheby's, London, February 19, 1998, lot 467. Grand Duchess Maria Pavlovna (1854-1920) was born Marie Alexandrine Elisabeth Eleonore of Mecklenburg-Schwerin, daughter of Grand Duke Friedrich Franz II of Mecklenburg-Schwerin and Princess Augusta of Reuss-Köstritz. She married the third son of Emperor Alexander II, Grand Duke Vladimir Alexandrovich (1847-1909). Considered one of the grandest of the Grand Duchesses, she lived with her husband at Vladimir Palace on the Palace Embankment on the Neva River, where she earned a reputation as one of the finest hostesses in the capital. 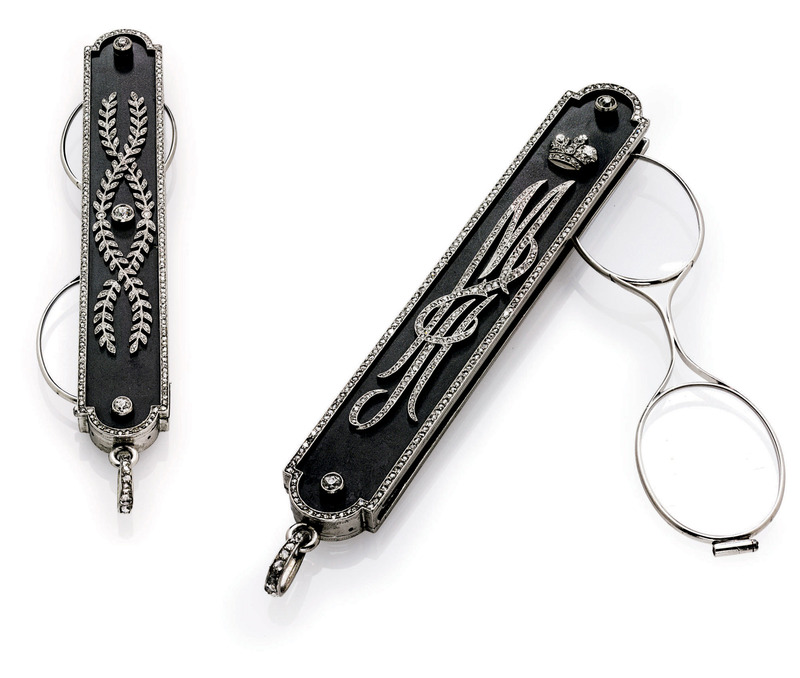 The present lot, unusual in the oeuvre of Fabergé, is related to a lorgnette presented in 1911 to Grand Duchess Elizaveta Feodorovna, sister of Empress Alexandra Feodorovna (sold Christie's New York, March 14, 1984, lot 436, and later in the Forbes Collection). The original design is illustrated in U. Tillander-Godenhielm, et al, Golden Years of Fabergé, Drawings and Objects from the Wigström Workshops, Paris, 2000, pp. 22-23, 57. VAT rate of 15% is payable on hammer price plus buyer's premium.